Are you concerned about the way your varicose veins look? Or, more importantly, how they feel? At MIMIT Health, we believe that people with vein issues should have the knowledge to make good, informed decisions about their leg health. 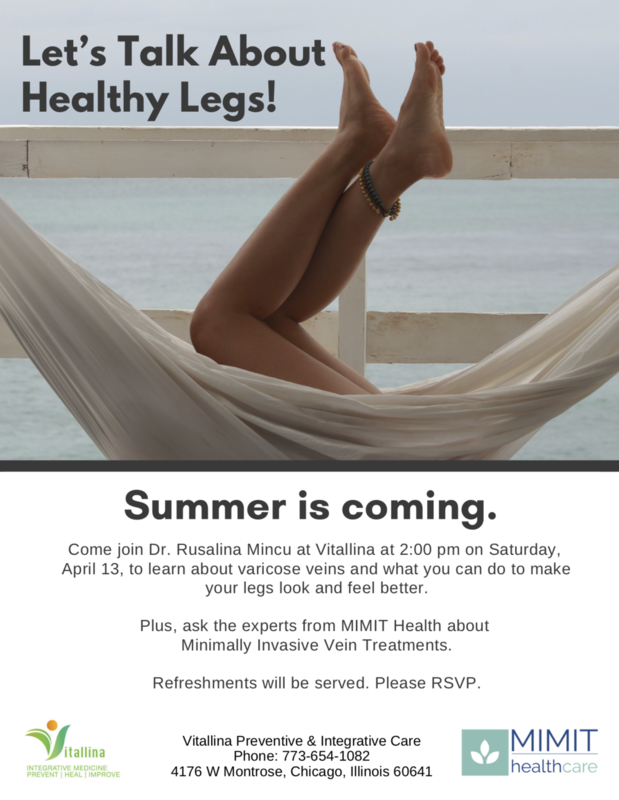 Come join us 2:00 pm on Saturday, April 13, to learn about varicose veins and what you can do to make your legs look and feel better. This varicose vein seminar is free, but space is limited. Call 773-654-1082 to reserve your seat. MIMIT Health offers Minimally Invasive Treatments for Varicose Veins. If you have any questions or would like to set up an appointment, Dr. Chopra and his associates can be reached 24 hours a day, 7 days a week, at (708) 486-2600 or email info@mimithealth.com.